Now it’s your turn to lift and slide your product range with Comar 7Pi LS+. Innovative lift and slide gearing provides smooth operation for door configurations up to 12 metres wide and 3 metres high, creating true glazed sliding walls. 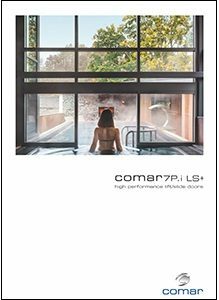 From one system Comar 7P.i LS+ provides delivered solutions, for the summer months maximise the opening space with the three-track slider which creates two thirds clear opening, whilst in the winter the lowest U-values keep out the cold. with the reassurance of the lowest U-values, so even in the coldest winter months daylighting is maximised and warmth assured. For a standard CEN size set of doors U-values are down to 1.4 with a 1.0 centre pane and using glass technology and Comar’s Enhanced Thermal Foam U-values of 0.74 are achievable. Glazing technology advances every day with new triple glazed units providing lower and lower centre pane values, acoustic glasses to meet enhanced performance criteria are widely specified, Comar 7P.i LS+ now provides a future proof solution with a glazing pocket of up to 57mm. With a simple change of gasket and beads the Comar 7P.i LS+ provides this flexible solution for all your glazing needs, with the lift/slide gear able to cope with weights up to 400Kg.